Below is a continually growing list of informative articles written on various topics that may be of help to you and/or your loved ones. If you or someone you know is struggling to raise a teenage boy struggling with anger, addiction, depression, learning disorders, or any other type of behavioral / psychological disorder, these articles may be of help to you. Triangle Cross Ranch is experienced in assisting troubled teenage boys in getting their lives back on track and regaining their once promising potential. It is through hard work that comes with ranching, an unassuming therapeutic tool that we have had tremendous success helping teens change their lives. 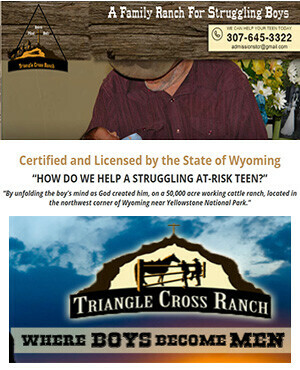 With years of experience as well as a group of highly trained staff, Triangle Cross Ranch knows how to serve your teen. If you or a loved one is ready to find help and get your troubled teenage son back on track, please consider the alternative, yet effective therapeutic treatment that can only be given here at the Triangle Cross Ranch. For more information call us now at (307) 645-3322 .